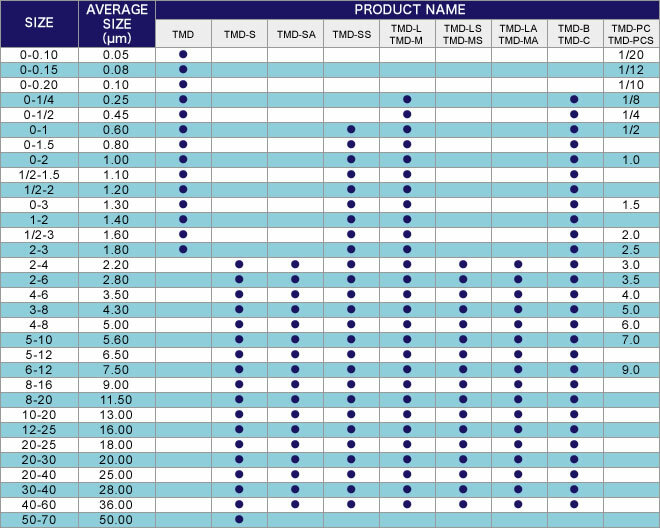 3 kinds, TOUGH・STANDARD・FRIABLE of toughness grains are provided by managing raw materials of micron size products. 3 kinds, Blocky・Irregular・Un-crushed grains are provided. 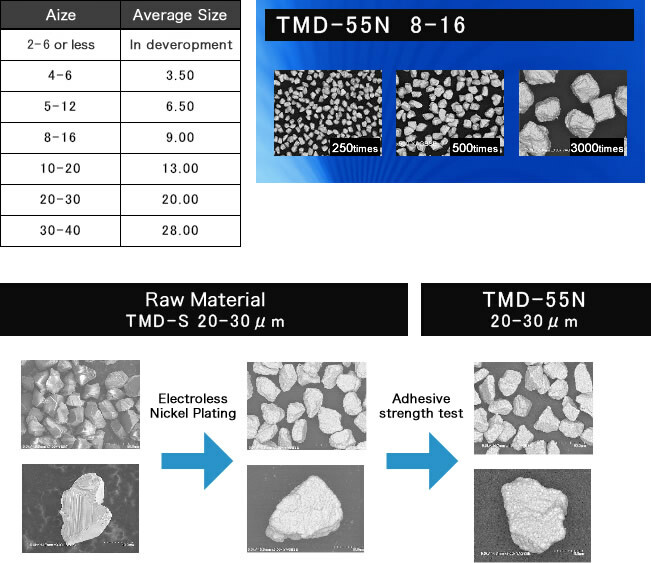 TMD STANDARD General and versatile use abrasive grain for wrapping, polishing, and slicing of cemented carbide, sapphire, ceramics, and etc. 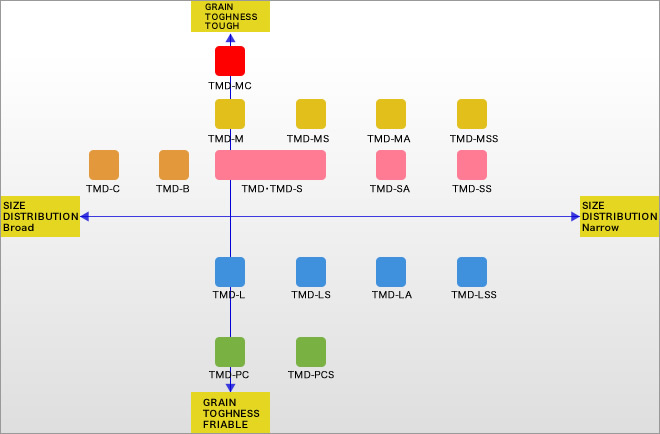 We classified the primary, secondary, and tertiary in our TW / TMD grains. It is suitable for applications that require precision finish surface. Specifications for précised sort will meet the needs of the individual. TMD-L FRIABLE PRODUCT Black color grains crushed from pure resin bond type diamond and has well friability and sharpness and suitable for high concentrated tool. TMD-M TOUGH PRODUCT Yellow color, very clean less impurity grains crushed from pure metal bond type diamond and has very tough crystallization. PRODUCT A product of the field not require an emphasis on the economy and strict classification. PRODUCT Un-crushed and mainly cube-octahedral grains is extremely tough and has well impact resistance and wear resistance. PRODUCT Polycrystaline diamond through coagulation binding by synthesized fine grains. Well performance for polishing brittle material such as sapphire and SiC. Please contact us for Ni and Ti coat products. 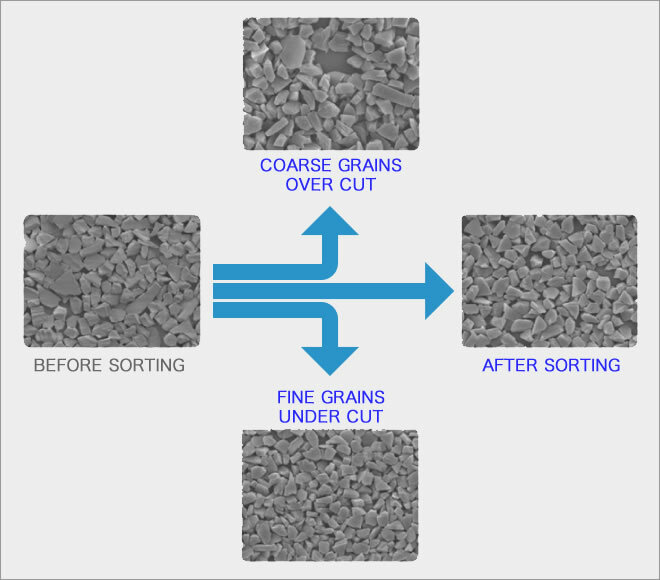 Our own sorting process removes both / either coarse size grains which tend to damage processed surface and fine size grains which tend to cluster from the original micron size diamond grain distribution. Over-cut and under-cut 2 steps classification process or either process are available at the request of customers. Electroness nickel plated abrasive by using well classified micron size diamond powder . Three kinds of toughness in raw material can be selected. Optionally it is adjustable from the Ni coating amount of 30% to 60%.